How do I change how long my screen is unused before it goes into sleep mode? 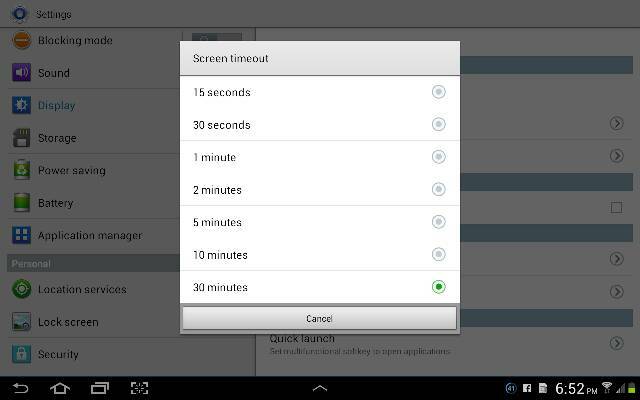 My galaxy tab 2 10.1 tablet only goes to 1 min. From what I can find out it should go to 30 minutes before screen going to sleep. I have three selections in setting under display, 15 sec, 30 sec, and 1 min. how can I get more time? And it doesn't have an option to turn it off either. Tried third party software, but it only would set in the program then Samsung settings over rides it. and any help would be appreciated. This might help you easily. Hope it works. Go to display or toher settings. I certainly appreciate the info! Where or how do I find saved emails on Galaxy s4? Made the jump to 4.4.2 on my Note 10.1, wheeeeew, was nervous! Why is my internal keyboard typing gibberish? How can I keep my Verizon Unlimited data when upgrading to the iPhone 6? Can a Galaxy S4 Active (AT&T) be used as a non contract phone?